I first saw Mulholland Drive with my friend Rana in her tiny Tokyo apart­ment. The film ended at mid­night and by the time we grew tired of analyzing its many twists and turns, we realized day­light had already crept in through her curtains. Two women, or four, or one. This is not a review per se, though it does contain aspects of one. It isn’t a celebration of the film’s artistic achievement either, though it will become clear that I consider it one of the most effective (and certainly most terrifying) films I’ve seen. Rather, what this text does is look at three aspects of the film which continue to baffle and terrify me almost nine years and countless viewings after that fateful night at Rana’s house. Disclaimer — If you haven’t seen the film yet, I suggest you do. You’ll either love me or hate me afterwards, but I’m willing to take my chances. I should also mention that I shamelessly adapted the above effect from Lost on Mulholland Drive, home to my favorite forum about the movie and the only people as obsessed with it as I am. Mulholland Drive is possibly the most effective representation of what has come to be known as Lynchian space. 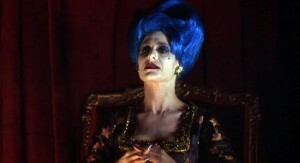 Indeed, director David Lynch is so wildly effective in creating location and mood as to merit the term. 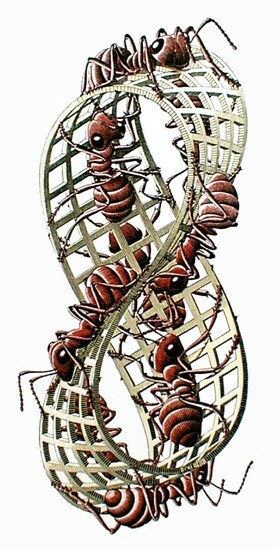 The plot of the film follows a Möbius strip that demands and rewards repeat viewings. What draws you back again is that the film begins with a scene that belongs at the end of the last time you watched it – a dream within a dream within a dream. Like a figure 8, two halves of the plot connect at one crucial point at which the story fragments and reforms. The first half of the film tells the story of a fresh-faced blonde named Betty (Naomi Watts) who arrives in Hollywood with high hopes of becoming an actress. She finds a mysterious brunette who calls herself Rita (Laura Elena Harring) hiding in her apartment after apparently losing her memory in a car crash. The plot, as they say, soon thickens in a series of enigmatic scenes featuring a slew of colorful characters who seem to know much more about the movie’s secrets than Betty, Rita or indeed we the spectators do: a dead body, a stubborn movie director, an enigmatic dwarf who gives cryptic orders over a telecom, and an apparently omniscient cowboy with a southern drawl and a ten-gallon hat. What on the surface begins as a pulpy piece of fiction about Hollywood and amnesia spirals into a schizophrenic trip as the identities of the two women start to merge. As if that wasn’t enough, the first half of the film then takes a sudden turn for the super-weird when Rita and Betty visit the nightclub Silencio. There a magician asserts over and over again: It’s all an illusion (is he referring to the film itself? ), at which point Betty finds that a mysterious blue box has suddenly materialized into her purse. The two girls run back home, upon which Betty suddenly vanishes and Rita is somehow sucked into the blue box. At this point, the plot enters the second half of the loop as a woman resembling Betty (but now apparently called Diane) is asleep in a position which looks uncannily familiar, and is awoken by none other than the enigmatic cowboy. This is followed by a series of highly disorienting shots of Diane’s dreams, illusions, and memories. The truth always seems within reach, yet somehow remains stubbornly elusive. Lynch pulls all this off with a directorial sleight of hand akin to a skilled magician: all the elements are there, we can almost tell how the trick is done, yet we are completely baffled. Lynch’s use of techniques like seamlessly connecting discontinuous points of view, positions of people and props, distance and perspective, in addition to the omnipresent score he creates with longtime collaborator Angelo Badalamenti in which musical cues are mixed with industrial sounds, all go to create a space that is drenched in a mood of unease and dread. The scene in question involves a film audition in which Betty (Naomi Watts) literally transforms onscreen from a perky ingénue into an enigmatic femme fatale, as Lynch deconstructs the conventions of director/actor relationship and the Hollywood casting system. A brief shot of the Hollywood Hills cuts to the interior of actress Betty’s apartment. “You’re still here?” she asks angrily. “I came back,” replies Rita uneasily. “I thought that’s what you wanted.” This early part of the scene initially takes us by surprise until the frame pulls back on Rita and we realize that she’s in fact reading from a script and that the girls are actually rehearsing a scene for Betty’s upcoming audition. In this latter half of the same scene, the girls start off in character, but soon break into laughter. We follow Betty as she approaches Rita, and the shots alternate between close-ups of Betty and Rita. It can be said that the camera angles required by the fictitious scene and by the actual scene are the same: The girls are initially at a distance and then come closer together, signifying increased intensity in the fictitious argument and increased intimacy in the actual scene. Then a brief transitional scene shows Betty arrive at the studio for her audition. In it Betty (the character) is extremely perky, and the initial impression one gets is that Naomi Watts (the actress) is over-acting. This impression will soon change once we discover the hidden depths of Betty’s character, and hence the hidden acting skills of the then-unknown Naomi Watts. Uncle Woody goes to work. This following scene starts as Betty is introduced to the cast and crew of the film. Her partner in the scene is Woody Katz, a middle-aged, over-tanned actor who is polite but somehow lascivious. This opening sequence is shot in wide angle, covering the entire room and all the characters in it. Great lengths are taken to explain to Betty who everyone is and exactly what they do, so that we are very much aware of Betty’s audience, even though, as we shall see, they are not shown onscreen during the audition proper. There’s something off-kilter about the dialogue and performances that is difficult to express through stills, and there is a sexual undertone to everything that Woody says (“Daddy’s best friend goes to work.”). Even his name itself (Woody) is a suggestive double entendre. AUDITION SCENE • Click on each image for a larger view. Stills taken from DVD of the film. Throughout this section of the scene, Betty and Woody are shot from the side in a medium two-shot, which continues as the audition begins. It’s the same fictional scene as the one that Betty and Rita rehearsed earlier, but it is played very differently: at a slow deliberate tempo, with a palpable air of sexual tension. However, while in the fiction of the scene Woody’s character is the instigator (in keeping with his actual personality), it is Betty (herself not her character) who is in control during the reality of the audition. An extreme close-up on the actors’ hands shows that when Woody hesitates to fondle Betty’s behind (as the fictional scene requires that his character do), Betty grabs it and firmly places it there. The rest of the scene is played in extreme close-up on Woody and Betty. The radical onscreen transformation, simultaneously and on three levels, reveals the troubled feelings of the fictional character that Betty is playing, the complexity of Betty the fictional actress, and finally the tremendous skill of Naomi Watts the real actress. Her initial overacting in playing perky Betty was in fact part of the act itself. The sequence ends with only Betty in the frame, revealing that the scene is actually about Betty/Naomi herself rather than the fictitious audition. – Magician at Club Silencio. After the audition, the view cuts back to the initial wide-angle shot of the room as everyone applauds Betty’s performance. Bob gives his usual cryptic remarks, “Very good, really. It was forced, maybe, but still… humanistic.” We are firmly back again in the lucid (yet fictional) reality of the film called Mulholland Drive. Many films contain a situation in which a character witnesses their own death, particularly films that deal with time travel, yet very few have dared explore at any great length the paradoxes of such a situation. Sigmund Freud famously said that the only scene impossible to imagine is one’s own death since one is always aware of one’s own presence as an observer. In this context, it is interesting to contemplate the position of the spectator, which raises existential questions which transcend the experience of the film and connect to fundamental desires that form the cornerstones of the psyche. Mulholland Drive is possibly one of the best films to contain such a scene, in which Betty finds a corpse who may or may not have been Diane (Naomi Watts again! ), who herself may or may not be Betty. The pretzel-shaped structure of the film is itself a double-paradox. The cinema of David Lynch, as that of Maya Deren, derives from a single unadorned point of view: that of the main character. Everything that occurs onscreen is a product of that point of view, and is presented to the viewer as a seamless surface that is spatially contiguous and temporally continuous. Lynch creates a totally subjective space that is infinitely more complex than the sum of its objective parts. For instance in the scene below, Diane’s reaction to the sound of breaking glass takes us from one location to another, which could itself be a memory of a past event. Diane... reacts... to a different place and time (click to enlarge). In another scene Diane reacts to the sudden reappearance of Camilla (also played by Laura Harring) only to reveal that she is actually looking back at herself. Here Lynch intentionally misuses the conventions of cinema by following a shot with a reaction shot that belongs in a different location and/or time. Camilla... appears... but it's just Diane (click to enlarge). If I am here now, then I must have left this place in order to get back to it and witness myself. However, if I have died here, then I could not have possibly left this place, hence I could not have returned to it to witness myself die. This paradox is connected to the terrifying concept of the doppelgänger, or the monstrous double: someone who resembles me in every way yet is not me. This has been used in cinema in a mysterious yet benign form, as in La double vie de Véronique (1991) or in a malignant form, such as in Don’t Look Now (1973). However, in Mulholland Drive the doppelgänger presents itself as the impossible alternative to an impossible situation: either Betty and Diane are the same person (who witnesses her own death), or they are duals of each other, doppelgängers caught in a cosmic rift. Many years later, when I arrived in Los Angeles to study film, I had my own terrifying experience of these three aspects. And one night, I too got lost on the long, tortuous road of the title. Mulholland Drive ends with a beginning — a single word whispered to begin the show, or to bring closure to everything: Silencio. Can’t wait to watch the movie. Can’t wait to watch the movie! I admire this article for the well-researched content and excellent wording. I got so involved in this material that I couldnt stop reading. I am impressed with your work and skill. Thank you so much. I together with my friends have been reading through the excellent procedures from your web page while all of a sudden developed an awful feeling I never expressed respect to the web site owner for those techniques. All of the women ended up so thrilled to read them and already have pretty much been taking advantage of them. Thanks for genuinely quite accommodating and also for making a choice on some exceptional information millions of individuals are really desperate to learn about. Our own sincere regret for not saying thanks to you earlier. Great V I should certainly pronounce, impressed with your web site. I had no trouble navigating through all tabs as well as related info ended up being truly simple to do to access. I recently found what I hoped for before you know it at all. Reasonably unusual. Is likely to appreciate it for those who add forums or something, site theme . a tones way for your client to communicate. Excellent task.. I once saw the collaboration bewteen Louboutin and Lynch, it was about photography i think! unfortunately i cannot find the official photos on Lounoutin’s website anymore! the louboutin collaboration gave me a strange vibe because it was all about fetishism! PS have to see twin peaks again because i never understood it!